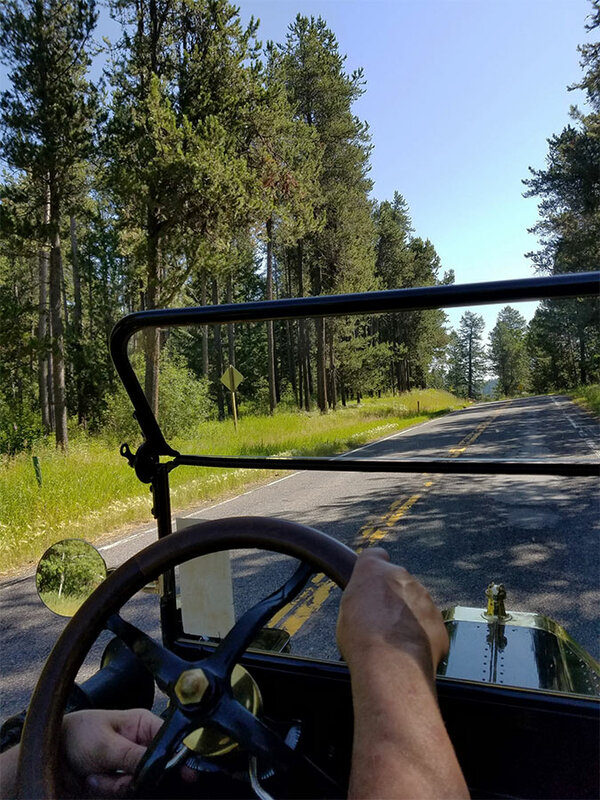 Model T Ford Forum: It was a wonderful trip while it lasted. It was a wonderful trip while it lasted. 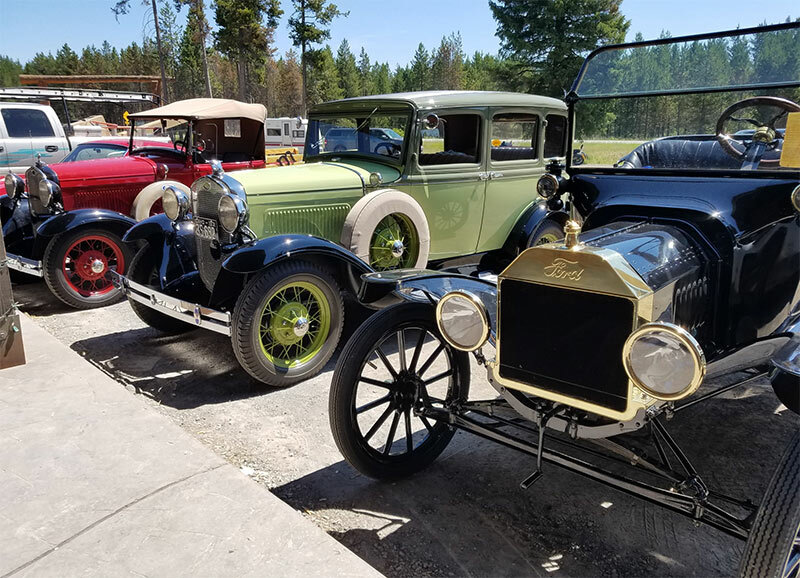 Model T Ford Forum: Forum 2018: It was a wonderful trip while it lasted. Last week was spent cleaning adjusting and updating everything on our 1915 Roadster for a trip to Virginia City, Mt. We started out Monday morning an hour earlier than our Model A friends and met them at Pond's Lodge for lunch. The drive was beautiful on backroads with green farmland all around us. Lunch was good and we started off. Some dirt gave us a little trouble starting and running so I turned the carb adjusting needle in and out to clear it. We stopped to fill our water jug and heard a loud pounding from the little 4-banger. 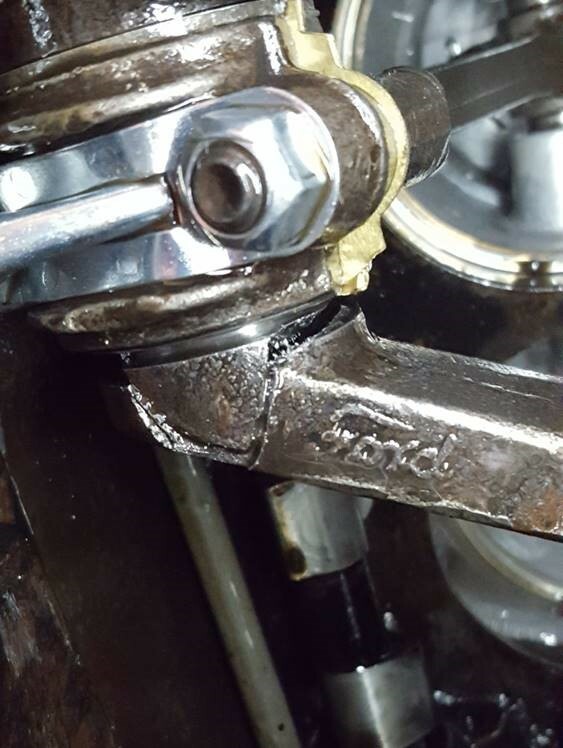 I can only imagine a connecting rod bearing had given up. We had the engine down 3 years ago and the bearings seemed pretty loose for the few hundred miles on it since it's 1985 overhaul. I snugged them up and all was well for a 200 mile trip and some around town driving. This was a hot day for us 90+ degrees but we were driving about 35 mph or so. I suspect the babbit was a little soft when it was poured as we have done much better in thousands of miles in the other T's. It is no fun when disaster strikes. We sent the others on their way to catch the reservations for Dinner and a "Christmas" show. We called for a wrecker and Joy and I had a pleasant visit with each other and several passersby. Much like a car show everyone wanted to know about the car and tell their stories. We only mentioned the breakdown to the few that asked if we needed help. The rescue driver was very pleasant and it seemed to be a great day even with the change of plans. The car will go to the back of the shop in line for attention at a later date. I was a little apprehensive on this trip from all the stories we hear of Model T problems. In truth we have traveled many thousands of miles with few major problems. But things do happen. Sorry to hear of your troubles, Richard, but your wonderfully positive attitude shines through as always! Rich, I'm sorry for the trouble, regardless, it's always distressing. You are always equal to the occasion, and your positive outlook is an inspiration ! My grandmother used to say, "The man worthwhile is the man who can smile when everything goes dead wrong. " Sorry about your misfortune Rich. Yin/Yang, or Karma struck, and somewhat east of you, a '15 touring woke up from a 35 year nap this AM about 10:45, and went for a spin today. We are as happy as you are unhappy, so life remains balanced. Rich, 40 years ago we were lying under the racer coaxing shoe leather in the rod bearing. I thought about doing that but opted for the tow truck. It had been a good 40 years without another bearing failure. It helped having an understanding wife with a cell phone too. Ah, the adventures! Saddened a bit to hear the downsides, but glad you made a decent day of it! Rich, I didn't realize that was an "annual-versary". I well remember cutting leather for that failed rod bearing and chugging along on 3 cylinders - but your T got us home from the hills ! It's amazing what you can do with them in a pinch. They're tough ! Pond's is a bit farther from home than we were at Gray's Lake, I'm glad your "rescue" went well. Richard, I sorry to hear of your problem. You did the right thing. The only major problem I've had in 55+ years of touring is I broke a crankshaft once. I would recommend anyone building a T engine to use a new style crankshaft, and better yet, the EE type. A couple of things came to mind. In our 55 years of touring we do a couple of long trips a year. That is well over a hundred trips. This is the third time we came home on a trailer and about that many times we had major repairs on the road. That is not a bad average. Although I hate to think about needing help, it seems there are always good folks around to rescue us and things are never as bleak as we might imagine. While the forum makes us conscious of the need to keep the cars in top condition it does give us a lot of things to worry about. I hope we all can overcome our concerns and get the cars out and enjoy them. Another pic while we were running good. Wow !!! Throttle wide open !! I hove your unexpected loud pounding turns out to be "only" a connecting rod. I had similar symptoms a couple of weeks ago, but a different diagnosis . . .
Chris, that looks familiar! Just did that.